the robin was big and happy, on the ground, looking for grub! Over a bit was what we think was a Blue Jay. If we get focused, perhaps this spring we'll put up some bird feeders and what not - the squirrels would love it, I'm sure. 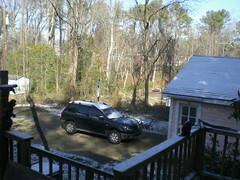 Did I say snow-crusted? Why yes I did. 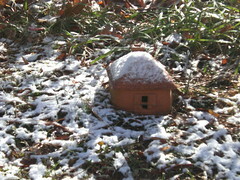 Our toad house is even nicely snowy. I have to admit, snow adds a lot of beauty to the world. Not so when peeps are slipping and sliding and falling down - be it a friend of a friend who's morning bicycle ride to work ended abruptly when she hit the newly constructed faux-brick pedestrian crossing, nor most any of my Northern Family. Let's keep it upright, people. My morning routine of crafting a pot of fine brewed coffee, along with Beagles of Love for my Boo, was rudely interrupted when I smashed a commemorative glass from Tyler's - minor ow-ee, but thems the breaks when you don't know your own strength! More rudely interrupting my morning revere was the news that FEMA really isn't any good at it's job. I know they're a gov't agency. Yes, perhaps the arm of the shadow gov't, but come on - helping out after a hurricane. Is it really that hard? Can't America do better than formaldehyde laced trailers? We can't? Really? crap.. The Justice Department now says waterboarding is not legal. Huh, didn't they say it was? Apparently, Congress needs to be talking with drug taking baseball players more than, I don't know, homeless vets? Oh, apparently Blue Cross of California has balls the size of Montana! But Cali Doctors aren't all that impressed. I see a few cross topic solutions, if I may. Have every ball player take in one Katrina survivor and one Iraq war vet. Make sure they don't have Cali Blue Cross healthy insurance, and have Larry Craig submit to waterboarding to prove he didn't do the things he admitted to doing at the airport bathroom. Yes, it's all a bit impractical, and misses the key details of a many-folded reality where, apparently, the US Congress thinks dealing with employee issues in a sanctioned monopoly is more important than protecting the citizens of the country from the malfeasance of an awfully powerful yet incapable agency. Call me crazy, but I want us to do better than this. It's not like we can much worse, is it? Ok. So, the birds are out, the snow is melting, my cut isn't bleeding anymore, it's a special Hallmark kinda day, and Blue is soooooooooo soft after her bath the other day, how can we not love her that much more?? Be careful out there peeps, don't forget to register to vote, then go and vote. 2008 = AMAZING!!! also ='s ROBOTS!! !